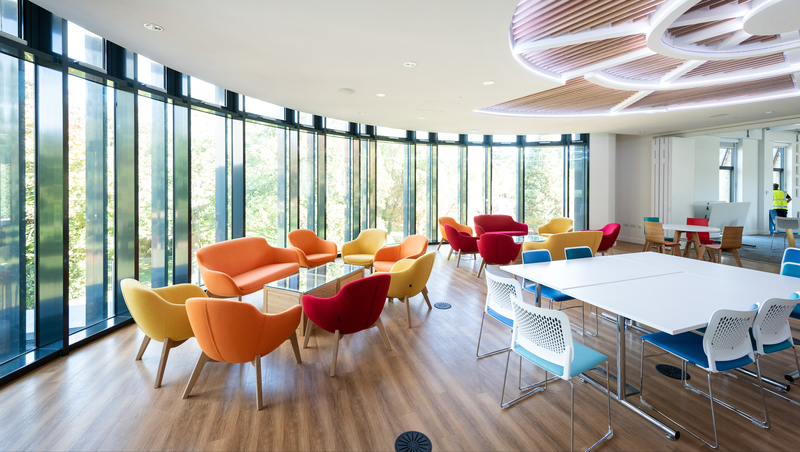 The Milner Centre building was designed to create a highly collaborative, research and social space. The critical part of the process was having the Milner Centre team, including faculty and students, working closely with and providing feedback to the architects at every stage of the project. From the design brief and initial plans, right down to the colours of individual pieces of furniture. This meant that instead of working from theories about how scientists and students ought to work, they drew on decades of real world experience to understand how people actually do work and study, to create the best work environment. One of the main inspirations for the building was Pixar Studios, where all the shared spaces like meeting rooms, bathrooms, and kitchens, are positioned centrally so that people have no choice but to run into each other every time they leave their office. The building committee borrowed this idea and put the Milner Centre social space, lecture space, bathrooms and coffee near the entrance to encourage people from every part of the department to run into each other, get to know each other, and work together. Flexibility was also key. The needs of the building may change over the years, so the building committee made the space as general-purpose as possible to allow the Centre to adapt as the needs of the group change. For example, offices for academics and grad students are the same size, so if the ratio of students to faculty changes, they can easily be repurposed without knocking walls down. As well as the functional, the committee worked on the design elements of the building. The spiral on the ceiling of the social area is inspired by the shell of the nautilus, and the coffee table is made out of fossils. The Alignment Wall looks like a piece of abstract art, but it’s actually a series of colour-coded gene sequences showing the evolution from fish to humans on the side of the building.